Today: Caroline proves that big flavor comes in simple packages. Many ingredients are sold in ways that are meant to save the cook a bit of time or effort -- like broccoli florets or peeled shrimp -- but despite their efficiency, they often leave something useful or tasty behind. Shrimp shells, for example, are incredible sources of flavor, and shrimp in their shells are less expensive because it saves the fishmonger a bit of work. More: Waste not, want not -- here's how to peel and devein shrimp yourself. This recipe is for those who might need to be convinced to buy whole shrimp -- the simple preparation will prove just how powerful its flavor really is. 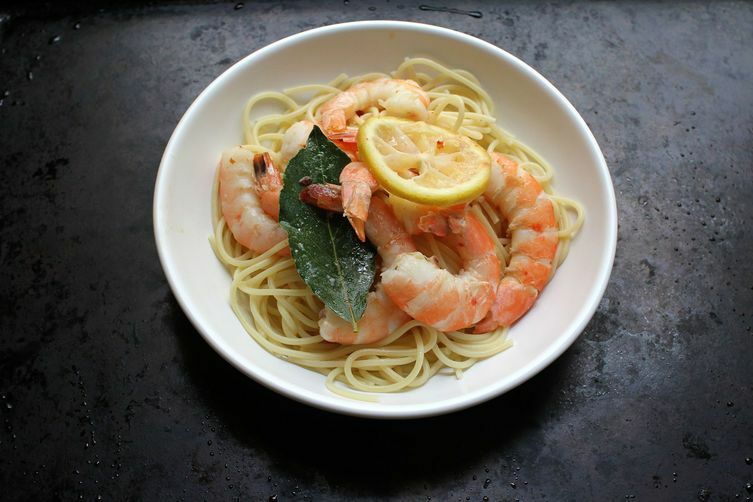 A few fresh bay leaves complement the juices that collect in the parchment packet the shrimp is baked in; these juices serve as a sauce for the pasta, and make the dish worthy of being savored to the last, precious drop. Keeping the ingredient list short but full of intention means that every flavor works in unison, with little waste. Waste, like shrimp shells, is a matter of perspective -- and this recipe proves that big flavor can come in simple packages.